4 Bedroom Detached House For Sale in Preston for Asking Price £269,950. The ground floor is home to an open plan modern kitchen/diner with a host of integrated appliances. It also features French doors to the rear garden, allowing the space to be filled with natural light and perfect for bringing the outside in. The spacious living room features a living flame gas fire and bay window to the front elevation, perfect for day to day living or relaxing. Added touches of convenience include a downstairs WC and utility room. Adjoining the kitchen/diner is a wonderful flexible family space to become either a playroom and/or formal dining room with French doors opening onto a conservatory. Upstairs, you will find four generously proportioned bedrooms, two of which are doubles, with the master bedroom benefitting from luxury en-suite facilities. There is also a modern three piece family bathroom. There is a new boiler and high pressure hot water system. 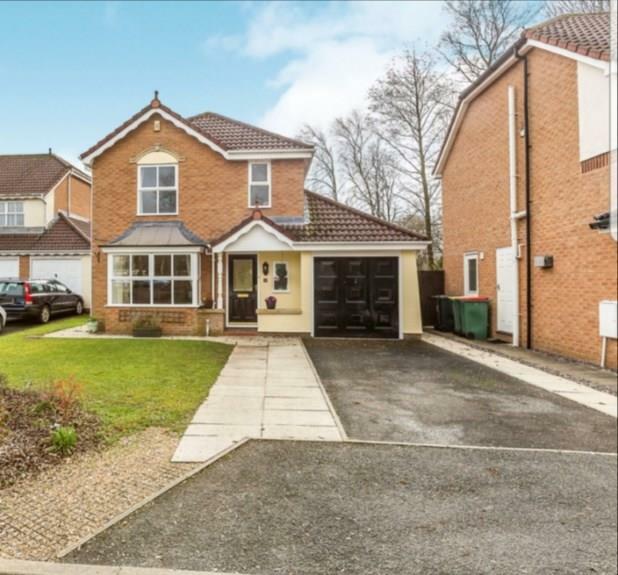 Outside, the property features a double width driveway leading to an integral single garage and a well stocked mature front garden. Beyond this point, a south facing rear garden, child friendly with secure fencing, majority laid to lawn with a patio area and a gorgeous view over woodland, enjoying the wildlife. The green leafy view at the front looking down the road is very private, mature and peaceful. Double glazed entrance door. Radiator, laminate flooring. Staircase leading to the first floor with carpeted flooring. Double glazed window facing the front. Radiator, laminate flooring. Low level WC, wash hand basin. Double glazed bay window facing the front with beautiful outlook. Double glazed window facing the side. Feature central living flame gas fire with an usual designed surround. Two radiators and carpeted flooring. Double glazed window facing the rear. Double glazed uPVC French doors opening onto the garden. Radiator, tiled splashbacks, laminate flooring. Complementary work surfaces, fitted wall and base units, stainless steel one and half bowl sink with drainer, integrated Bosch electric oven, gas hob, over hob extractor, space for a dishwasher and fridge/freezer. Double glazed door leading out to the side of the property. Radiator, laminate flooring. Fitted wall and base units, single sink with drainer, space for a washing machine and dryer. Double glazed uPVC French doors opening onto the conservatory. Radiator, carpeted flooring. Double glazed uPVC French doors opening onto the garden. Double glazed uPVC windows facing the rear. Electric eco heater, tiled flooring. Double glazed window facing the side. Carpeted flooring. Loft access, boarded for storage with lighting. Airing cupboard housing a high pressure hot water tank and additional shelving. Double glazed window facing the front. Radiator, carpeted flooring. A pleasant outlook. Television/phone point. Double glazed window facing the side. Low level WC, wall mounted wash hand basin with vanity unit, double walk in shower with rain fall shower head, additional hand held shower. Chrome heated towel rail, wood effect vinyl flooring, spotlights, extractor fan, illuminated mirror and shaver point. Low level WC, wash hand basin, panelled bath with thermostatic shower over. Radiator, vinyl flooring, tiled walls, extractor fan and spotlights. Manual up and over door. Power, lighting and Worcester boiler installed in 2017.